Response: After a character committed to a story is wounded, exhaust John & Jessie Burke to wound a character committed to the same story. Flavor Text: Dead or alive... but mostly dead. When I pay 4 for a character, I expect some Willpower, Toughness, good skill, maybe Invulnerability even. This offers none of the above. Instead you get a conditional "win more" ability that encourages you to hang back with your shiny new 4-cost character. Thanks, but I think I'll save up for a Basilisk instead. This one is definitely a disappointment. Even his ability being a response hurts, since it doesn't happen in time to change the story resolution. It needed to be a disrupt to be useful. I think this card is unplayable unless you are getting the Government discount. Good call, RichardPlunkett. Maybe if John Jessie flat-out destroyed that committed character, or if they wounded ANY character, they could be worth it. It's pretty easy for your opponent to see this ability coming though, so it will rarely even trigger. 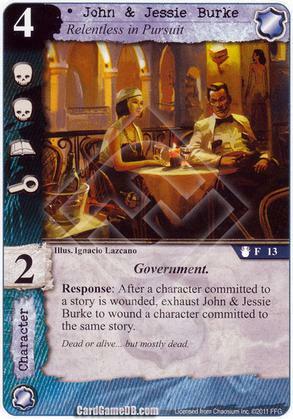 The one redeeming quality of this card is it's a Government character with an arcane icon. Unfortunately for this relentless couple, Military Attache at the same cost took even that away from them.